The initial few chapters have been rolling out in the Ensign and Liahona since February this year, and those with the Gospel Library app have been able to download these chapters under the “Church History” heading. Elder Snow has championed this effort to make an accurate narrative history available. Saints is accessible, but the content reflects history rather than faith-promoting folklore (apologies to all the well-intentioned but inadequate storytellers of the past). For those who desire solid history that won’t destroy your faith, I strongly recommend you read Saints. I obviously haven’t had a chance to read all of Saints yet, but the opening chapters have clarified points that critics twist to try to destroy faith. Volume 1 covers the history of matters affecting the Church from 1815 through 1846. This is a fascinating timeframe, where all modern beliefs and practices of the Church were introduced. I look forward to seeing how this volume discusses the events leading up to Joseph Smith’s death and the flight of most Church members from Nauvoo. Until Monday, I challenge you to read the first seven chapter of Saints and share what “A Ha!” moment you experienced. For me, the part that was “Wow – Cool!” was the discussion of the great awakening, explaining that there was a redux around the time of Joseph’s Vision. I haven’t read all 7 chapters yet but the church put out a short video about Mary Whitmer who was shown the gold plates. This was my “A Ha!” moment. Looking forward to reading that story when the whole book comes out. I keep forgetting about Mary Whitmer’s testimony. She’s one of the people who need to be on my list of Joseph’s contemporaries who had to have been “in on it” (ie, a co-conspirator) if Joseph Smith was a fake and made it all up. I’d like to see a paper, or a book, listing such people, and giving their connection to Joseph and their recorded testimonies of miraculous incidents, or viewing the plates, an angel, etc. I don’t mean an internal spiritual witness, but those who bore testimony of external and objective things; things which critics would have to dismiss as deliberate lies, and not just imagination, or being duped/fooled/hypnotized by Joseph. The three witnesses, the eight witnesses, Emma, Mary Whitmer, Sidney Rigdon, all easily come to mind. I think Brigham would have to be on the list, but I can’t easily point to a single event, just going by memory. I see this as a gaping hole in the critics’ argument that JS was a fraud. There were just too many people closely connected to JS who would have had to have been co-conspirators if it was all a lie. None of them ever “came clean” and admitted it was all made up. Even among those who got disaffected from Joseph and/or the church, none ever went back on their testimonies of the foundation truths they witnessed or participated in. Has such an attempt of collating and summarizing the available material using that criteria been done? I just received an email from Deseret Book, announcing it was free in ebook form, and audio, for their Des Book App. I just downloaded it for free from Amazon for their Kindle app as well. 1) They focus on Mary Ann Weston [Davis Maughan], a woman I came to admire while researching as part of my review of Polygamous Wives Writing Club. Mary’s first husband was beaten to death in England because of his faith in the restored gospel. 3) There is significant discussion of the men who were sinning circa May 1842, though only John Bennett is specifically named regarding the seduction of Catherine Fuller. 4) I love how prominent the experience of women is in this version of the history. 5) I appreciate the nuanced and gentle treatment Emma Smith receives with respect to her actions following Joseph Smith’s death. 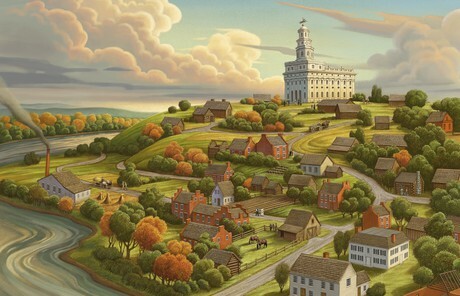 A) Bennett’s arrival in Nauvoo is characterized as occurring in September 1840. The footnotes don’t support this directly, and Joseph Smith stated in his July 1842 sermon (republished in the Times and Seasons) that Bennett had arrived in August 1840. B) There is no mention of Bennett’s attempt to marry a young woman in Nauvoo, which emphasizes why it was particularly problematic that Bennett was still married. C) The text reflects the former timeline where Louisa Beaman became Joseph’s plural wife in 1841. According to Gary Bergera, Joseph Bates Noble cannot be trusted on the date or the year (which Noble gave as 1840, 1841, and 1842 at different times, though positively asserting it couldn’t have been as late as 1843). According to Don Bradley, the ceremony uniting Louisa and Joseph could not have occurred before Louisa and the Noble family moved from Montrose to Nauvoo in fall 1841, shifting the ceremony from spring 1841 to spring 1842. An edit of this would feature Joseph’s conversation with Dimick Huntington in fall 1840, then discuss Joseph’s covenant with Zina in late October 1841. It would also be useful to briefly reflect on the item in Chapter 11 (p. 121) where Joseph initially came to understand in 1831 that plural marriage was sometimes an acceptable practice. D) There is no mention of when Bennett seduced Catherine Fuller. It would be useful if a few words were inserted to allow the casual reader to place this seduction before she was seduced by another man in July 1841. E) The text asserts that Joseph taught some of the apostles about the doctrine of plural marriage in the week after they returned from England in July 1841. (Chapter 37, footnote 6). However the sermon cited in the footnote is not the sermon you get when you click on the link. I suspect when the link is fixed that the language of Kimball’s 2 Sep 1866 sermon will be seen to be less specific than one would assume from the text. F) Though I haven’t yet read the entire book, I see that the reported union of Fanny Alger and Joseph Smith is discussed in Chapter 25. In my opinion it is too strong to assert that Levi Hancock necessarily performed a ceremony uniting Fanny and Joseph, and I would have inserted a qualifier regarding whether or not there actually was a covenant (or other significant interaction) between Fanny and Joseph. But given that Saints is going for transparency, it would seem disingenuous to many if this episode were questioned as I question it. In case you are still reading, I reiterate my enthusiasm for Saints. It is accessible and explains in straightforward language what believers of the day understood about events that were occurring. Oh, another “A Ha!” moment for me was realizing that Brigham had been the one responsible for evacuating the Saints from Missouri. To ensure that everyone was able to escape, Brigham asked the Saints in Missouri circa 1838 to covenant to leave no one behind. This is a significant predecessor to the covenant he would ask the Saints to enter into in October 1845, when he asked them to covenant to do all in their power to assist everyone who wished to flee Nauvoo to get out. Many 1845-1846 covenants in the Nauvoo temple appear to be related to that October 1845 covenant (many “plural marriages” bound widows and unmarried women to living men who could assist them in fleeing from Nauvoo). Your point is excellent–and very problematic for those who assume that Joseph was just making it up from the beginning. For me, a key mark of Joseph’s authenticity has always been the complete absence among his early associates of persons who dissented from him and then claimed that the whole thing was fraud . Many rejected Joseph at some point and claimed that he had “fallen” from his prophetic calling, but all continued to maintain that divine work was done in the beginning. That’s an amazing record for a fraudster in keeping together a conspiracy, particularly after he was dead and his hangers-on could have cashed in big in the golden age of the anti-mormon exposé.